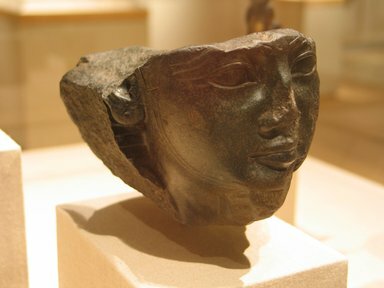 Fragmentary head of a Kushite king in green basalt (?). Beard almost entirely gone. Left chin and cheek badly chipped, as is nose. The fragment is of exceptional quality and in spite of the very hard stone, the face is modelled with extraordinary detail. Condition: Head preserved from just above the eyes down to base of neck.